Leading Manufacturer of eps panels and insulated roof panels from Sonipat. We are engaged in fabricating and supplying a wide range of EPS Panels (Expanded & Extruded Polystyrene). These are suitable for ceilings where their strength, enables in increased spans. Owing to their good insulation properties and high strength to weight ratio, these panels are very useful. 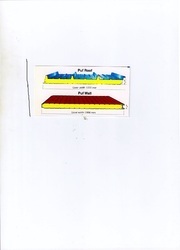 Moreover, two grades of EPS panels are used in Thermocol panels of standard density (SD) and high density(HD).